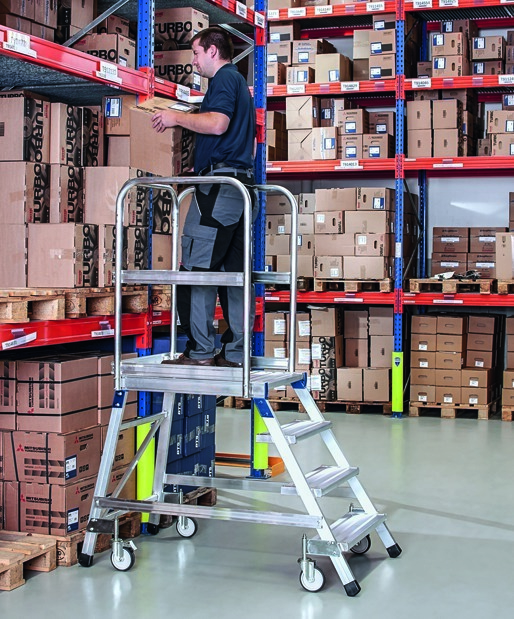 Zarges Mobile Work Platforms offer a range of working platforms designed for a wide variety of uses in both dry and wet conditions, indoors and outside. Versatile, manoeuvrable and rock solid, it’s the work platform you need when the job demands use of both hands, making complex repairs and maintenance simpler and safer and making it easy to move on to the next job. Zarges Mobile Work Platforms come with either extruded aluminium alloy steps and platform, for general use, or open grid steel for added non-slip safety in hazardous environments like wet rooms. Choose single or double sided access, with platform heights from 720 mm to 1.92 m all designed to take loads of up to 150 kg. The platforms are reached by 200 mm treads for a comfortable ascent and each features a large, 600 x 800 mm working platform, providing enough space for a worker and their tools allowing them to work in comfort and safety for prolonged periods. Workers are protected by a 1 m high hand rail on at least two sides with a double sided hand rail for the steps available on most models, and mandatory for platforms with five or more steps. Zarges Mobile Work Platforms are easy to move, with four sprung swivel castors making it simple to handle, even in restricted spaces and they’re just as easy to secure, with strong brakes on two of the wheels so once it’s in place, it stays in place.